Shamanic healing is a very ancient technique practiced by our great ancestors throughout the world. Every culture has their own traditions, but it is often a combination of energy work, journeying, connecting to spirit, working with sacred stones or crystals, working with the breath, using sound, and the purification that comes from the burning of sacred plants. The purpose of all of these elements is to bring them together to create a session that is exactly and uniquely what a person needs to bring balance to their Body, Emotions, Mind and Spirit. Shamanic healing excels at clearing the energetic imprints that are keeping you stuck in old patterns, trauma, or pain. When these imprints are cleared, space is then created. Space for you to fill with new experiences, and your dream of the future. Each and every session is customized to your needs. I offer both in-person and remote shamanic healing sessions. Sessions are 1.5 hours in duration. Everything is energy. Everything. And energy follows intention. Always. In this session intent is held by the practitioner, and the client. Spirit is asked to support the healing and the practitioner is guided by the energies and spirit of the client. What Kinds of Things Can It Help With? Removal of Energetic Attachments: inappropriate and unhelpful energies that can create poor health, sudden financial loss, unexplained confusion and deep depressive states that may also be accompanied by nervous break downs and losing interest in life. Open blocked chakras and chakra alignment. What to Expect In a Shamanic Healing Session? Your session begins before you arrive. I connect to the spirits on your behalf and make an offering outside to pachamama asking for the best healing for you. Sometimes I receive insights as I do this, and sometimes I do not, but any information I receive will be shared with you when I meet with you. This offering is to give thanks to spirit, and it helps set the intention to create sacred space, and to ask for support for the session happening later that day. root of this pattern so that it can be removed at the source. I will use my mesa. The mesa is a portable altar that contains power objects and medicine objects. 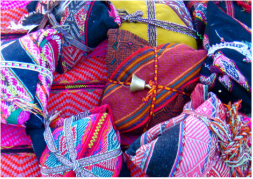 It is a cloth bundle used for healing from the Q'ero lineage of the Andean tradition in Peru. The mesa contains sacred stones or kuyas. A shamans mesa is used for healing, divination, prayer and ceremony. A mesa deepens the awareness of non-ordinary states of reality and is a spiritual anchor that keeps us grounded. I will often burn sacred plants as well. For most of the session you will be laying down, under a sacred medicine blanket and will relax and prepare to receive the healing. I may guide you to breathe a certain, or simply focus on your breath during key points in the session. Even in distance healing sessions, I will work with you the same way. Once you relax into the session, I will begin to work within your luminous field (that beautiful energy field that surrounds your physical body). Everything that occurs in the physical has it's beginnings in the luminous body so we want it to be clear and balanced and strong. I may place different healing stones onto different points on your body as I work on healing and balancing your chakras. If we are working at a distance, I will place the stones on you energetically. Throughout the session, I may use a rattle to dislodge heavy energy, I may drum, chant, sing, use other sounds, smudge you with smoke from scared plants. I may also be guided to journey to different worlds to retrieve energies or gifts that will support you on your path. Each session is unique to the person receiving it. I am guided by spirit and rely on my shamanic tracking to guide the way. During all parts of the session your role is to simply relax, and stay focused on letting go of that which you no longer need. In addition to remaining open to accept the wonderful new energies coming in to support the healing. Everyone has different ways of feeling energy. Some people become very relaxed and fall asleep or enter into a deep state of relaxation in between sleep and wakefulness. You may feel heat or a buzzing or tingling sensation. You may feel waves of emotion, and release with tears or even laughter. You may become warm or cold. You may see colours, or visions, or hear things in your inner mind. All of this is completely normal. It is also very normal to feel nothing at all. The energy is moving and rearranging and energetic shifts are taking place whether you can feel them or not. At the end I bring your new energy into harmony with your physical body, so that you can integrate the new energies with ease. If we are working at a distance, again, I do this through intention and it is every bit as effective as it is in person. Then I gently call you back and once you re 'back' we have a brief conversation to share our experiences. I will share whatever I receive. Sometimes I receive a little bit of information and sometimes I receive a lot. I never know going in how it will go, but trust that whatever I do receive to share is exactly right for you. If I was guided to retrieve energies for you (a mini soul retrieval) then I will give you tips on how best to integrate the energies that have been returned to you. After your session it is important to be gentle with yourself and remember to nurture the new energies. I sometimes also receive 'homework' from spirit to pass onto you and if that happened I will share this at that time. Even if I receive no specific guidance, I will always send you home with tips on how to integrate the new energies and to assist you in continuing your path to personal empowerment. I may also guide you to create something as a symbol of your new life and to help to anchor the new energies. It might be creating a picture, walking in nature, laying on the earth, having a flower bath, drinking a particular tea, journalling, making an altar, or even creating a sacred fire. These creations are important as they help to anchor you to your new reality. They become a touchstone to your new world. As your practitioner I am limited in that I cannot integrate this work for you, only you can do that. It is important. I am simply a conduit between you and spirit, allowing myself to be so, in order for healing to take place. The work that you continue to do on your strengthens this spiritual connection, and this is where the real healing occurs. Soul retrieval is recommended for individuals that feel traumatized from emotional or physical events and they are having trouble moving past them. Sometimes long after the troubling event, accident or illness you can still feel stuck in the energy of the past. Sometimes Soul Retrieval is necessary if you feel you have lost something, lost your essence, have been victimized, and/or if it feels like something has been 'taken' from you. That 'something' is your personal power. A soul retrieval is part of the process in taking your power back but it is important not to rush into this process. You need to be strong enough so that you can integrate the pieces when they come back to you. This is why a Shamanic healing session is a pre-requisite of this process. During that session you can discuss your desire to have a Soul Retrieval. During the Soul Retrieval process, the practitioner and client enter into a meditative state together in which the practitioner journeys into the different worlds to retrieve the pieces of the soul that were lost due to post traumatic events. Thereafter, the individual is able to integrate that part that was lost into their present to bring wholeness and joy into their lives. It is very common for individuals who are being journeyed for may feel that they travel along, or see visions or feel things in relation to the journey as the process unfolds. A shamanic healing session is the pre-requisite of this process, to receive healing and balancing and to determine if soul retrieval is right for you. A mini soul retrieval may be part of a Shamanic Healing session but a Soul Retrieval on it's own is a much longer, more intense process. Soul retrieval is to be treated as a means to compliment proper professional care but not to replace it. The benefits of doing soul retrieval are many. It restores self confidence, eliminates addictive behaviors, increases self-esteem. Physical and spiritual energy increase and much more.